미국 풀로디아주 Miramar에 위치해 있는 오디오 전문 메이커인 JL Audio사가 개발 소개한 초 저음용 서브우퍼 시스템이 요즘에 와서도 화제가 되고 있다. 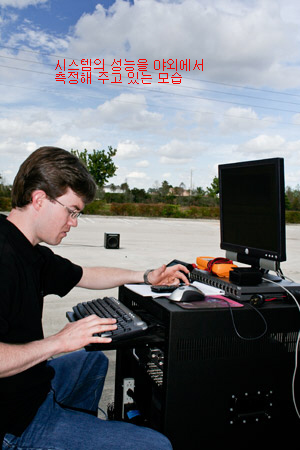 이 제품은 동사가 2004년부터 소개한 모델로 초 저음용 서브우퍼 시스템으로는 고성능을 자랑한 하이엔드 설계 시스템이다. 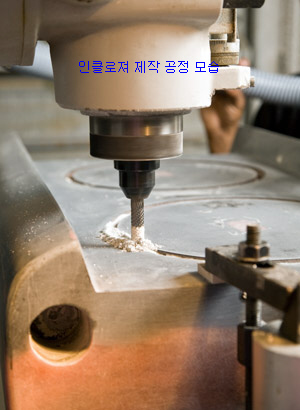 전부 4종류 제품을 소개하고 있는데 이중 모델 g213은 수준 급 설계 제품으로 중량만도 한 개가 163kg이며 판매 가격은 미화 11,000불이다. 이 제품의 제조 공정과 제품의 특징을 알아보자. 시스템의 중요 구성을 알아보면 모델 g213은 2개의 언밸런스 RCA젝과 밸런스 XLR젝을 사용 스테레오 또는 모노럴로 쓸 수 있게 되어 있다. 완전 밀 폐형 구조의 인클로저로 제작 되어 있으며 사용 드라이브는 13.5" 구경 저음용 우퍼 2개로 되어 있다. 내장시켜 놓은 파워 앰플리파이어는 실효 출력이 3800와트의 대용량 급이며 검정 피아노 칠 (High-Gloss Black)로 마감처리 시켜 놓았으며 외형 디자인은 중량급 제품답게 멋있게 꾸며 놓은 모습을 볼 수 있는 초 저음용 서부 우퍼 시스템. 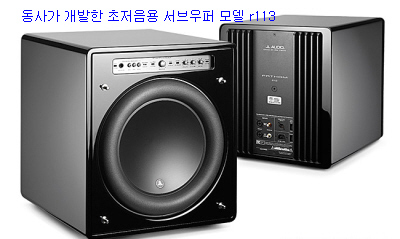 모델 g213 Gotham 서브우퍼시스템의 특징은 동사가 개발한 혁신적인 기술을 들 수 있다. 즉 거실에서 시스템을 사용할 때 가장 이상적인 상태로 저음대역을 재생시켜 들을 수가 있다. 즉 교정 마이크로폰이 작동하여 3분 정도의 시간 지나면 거실의 최적 최적상태의 저음 대역을 설정해 줄 수 있게 되어 있다. 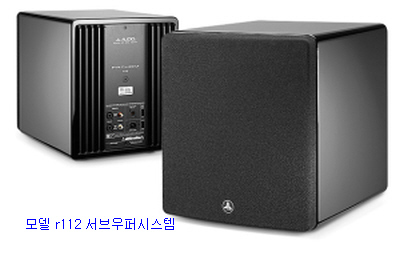 이 제품은 Home Theater & Sound 2007년 1월호와 2월호에서는 "Product of the Year"로 계속 선정된바 있다. 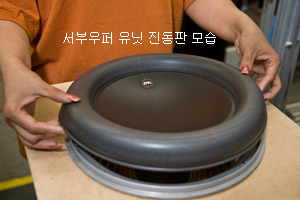 또한 the Perfect Vision 2007년 1월호에서는 "Subwoofer of the Year"상을 받았으며 이전에는 CEDIA 2004에서 베스트 사운드(Best Sound)로 수상한 경력을 갖고 있는 제품이다. 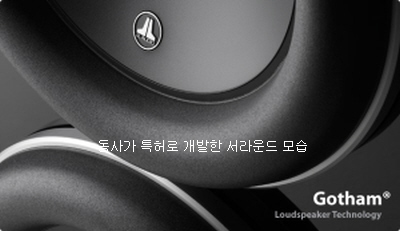 오디오 전문 잡지인 Stereophile을 위시해The absolute, Home Theater 그리고 Stereophile Ulimate AV지 등을 통해 시스템의 성능을 전문가들로부터 검증을 받아 자세하게 설명 된 바도 있다. 시스템 제작은 알루미늄 재질과 스테인리스 강철 등을 사용 수 가공 방식으로 만들어졌으며 거실의 인테리어로서도 손색이 없이 다른 가구들과 어울릴 수 있는 멋진 디자인을 보여준 시스템이다. 이 시스템은 중량급 서브우퍼시스템으로 인클로저 마감 처리도 완벽하게 되어 있다. 우선 사용한 저음용 우퍼 유닛에 대해 알아보자. 동사는 이 유닛을 개발하기 위해 10년간 연구 기간을 갖았다고 한다. 이를 위해 유닛의 분석 시스템을 개발 첨단 최신 기술을 도입해 이 제품을 개발 하기위해 많은 인력과 투자를 아끼지 않았다고 한다. 이 유닛은 DMA-Optimized Motor System으로 다음과 같이 설명하고 있다. 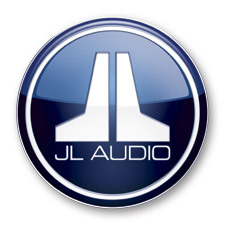 "DMA is JL Audio¡¯s proprietary Dynamic Motor Analysis system aimed at improving dynamic motor behavior. 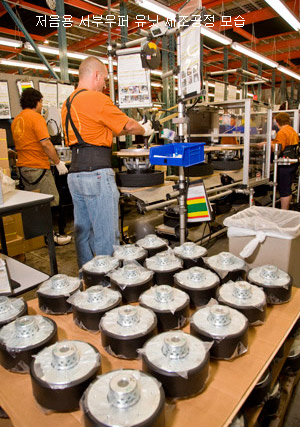 As a result of DMA optimization, our loudspeaker¡¯s motor systems remain linear in force over an extreme range of excursion while maintaining a highly stable fixed magnetic field over a wide power range. 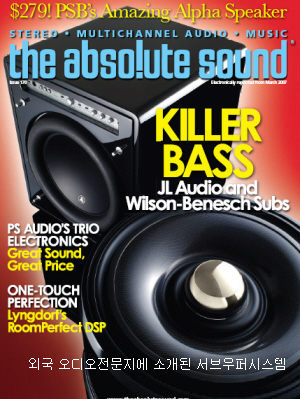 This leads to vastly reduced distortion and accurate transient performance... or put simply: tight, clean, articulate bass." 또한 동사는 대 출력을 재생시켜 줄 수 있게 개발한 이 유닛의 서라운드 OverRoll Surround는 미국 특허 (U.S. Patent #5,687,247 & #5,949,898)제품이다. 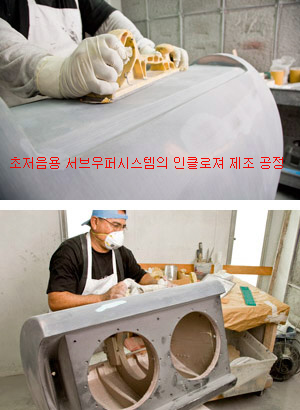 최소의 질량감을 갖게 만든 우퍼 진동판(W-Cone)은 미국 특허 (U.S. Patent #6,496,590)를 받은 것이다. 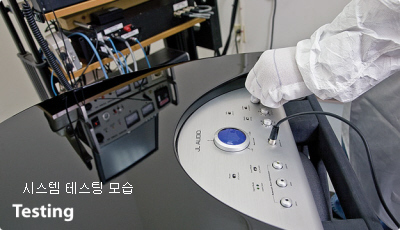 이외에도 Floating-Cone (U.S. Patent #6,501,844) 그리고 스파이더 Plateau-Reinforced Spider Attachment 특허 (U.S. Patent #6,118,884), Elevated Frame Cooling 테크노라지 특허(U.S. Patent #6,219,431 & #6,229,902), Radially Cross-Drilled Pole Piece 특허(U.S. Patent #6,243,479) 등을 사용해 만든 시스템이다. 동사는 이 제품 이외에도 Fathom 시리즈 모델 r110을 위시해 r112 그리고 r113등이 있다. 이 제품들이 어떻게 만들어 지는가를 사진을 통해 볼 수가 있다. 또한 여기에 사용된 특허에 관한 설명은 영문을 그대로 기재해 놓았으므로 참조하시기 바랍니다. Effective Piston Area: 214.70 sq. in. / 0.1386 sq. m.
The W-Cone is a unit-body cone assembly that delivers astonishing cone stiffness with minimal mass. The shape also provides incredible torsional rigidity, which is critical to maintaining voice coil alignment at the suspension limits. 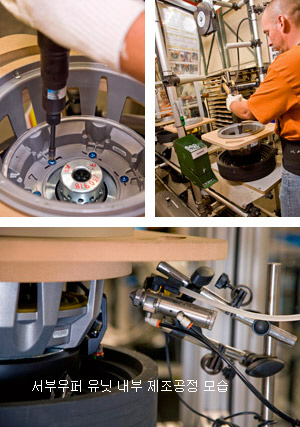 This assembly technique ensures proper surround geometry in the assembled speaker for better excursion control and dynamic voice coil alignment. A derivative of JL Audio¡¯s VRC technology, this bulletproof suspension attachment relieves stress from the spider material at high-excursions for enhanced reliability. 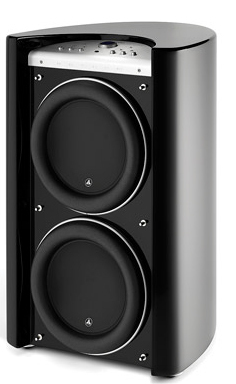 This feature delivers cool air through slots directly above the top-plate to the voice coil of the speaker. 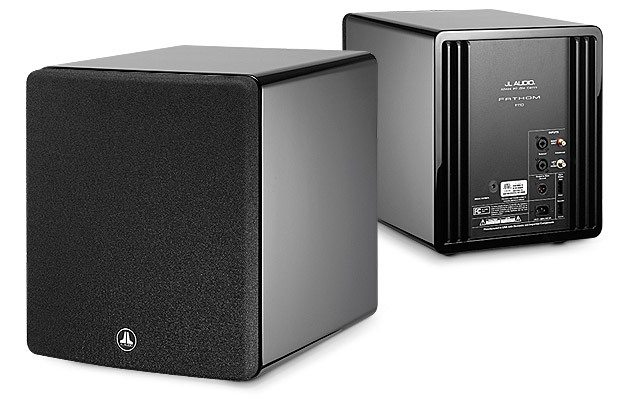 This not only enhances power handling, but also sound quality by minimizing dynamic parameter shifts and power compression.